Apparently my theme this week is see it, like it, let me tell you where to get it. Those are always fun posts. 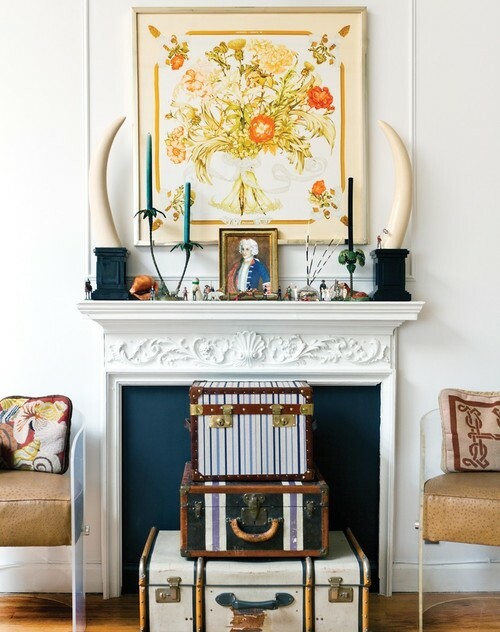 Love everything about this vignette below, as photographed by Porter Hovey for the book Heirloom Modern, except for maybe the suitcase trunks (never really got on that train). But I especially love the look of the framed scarf. The feminine, vintage quality is stunning against the other quirky elements making up the arrangement. Framing scarves is nothing new but I think pairing a vintage scarf like this with modern elements is a really fresh take on the look. And your scarf need not be a $300 Hermes situation...vintage scarves are so easy to come by on Etsy and eBay in every pattern, color and price point available. And their large scale make for a great wall-filler. I framed a Nicole Miller amazingly detailed 36" square floral scarf about 18 years ago and still love it! Not Hermes but that's ok.
Where do you get frames this size? Do you like the plain acrylic ones I see a lot with scarves? Thanks great posts.